We are happy to announce that Live Work Home has been awarded a 2012 AIA Housing Award in the One and Two Family Production Homes category. On Saturday, May 19th, Rick Cook was recognized for this notable achievement during an awards ceremony at the AIA Convention in Washington, D.C. Winner of the “From the Ground Up” Competition, the LEED-Platinum certified Live Work Home considers the longevity and livelihood of the Near West Side of Syracuse, NY, a shrinking city affected by the migration of significant industry throughout the 20th century. Today, the neighborhood faces high unemployment rates and lacks space for creative industry. Affordable housing alone does not respond to the needs of the neighborhood; its vitality as a community is a question of sustaining livelihoods and the social diversity. Just as pockets of extreme blight and vacant lots can weaken a neighborhood, adding density to the small-lot patterns of Near West Side with mixed social and economic activity will re-energize the community. Long-term operational affordability and low-tech passive strategies were of prime consideration during the design process when addressing the needs of a diverse population of potential occupants, including students and aging residents. A high-performance building envelope constructed of Structural Insulated Panels (SIPs) saves energy, improves comfort, and reduces both construction waste and on-going costs of ownership. A heat recovery ventilator circulates healthy, filtered air year-round and efficient, hot water-based heating is delivered through a radiant floor, which also allows maximum flexibility in room planning. 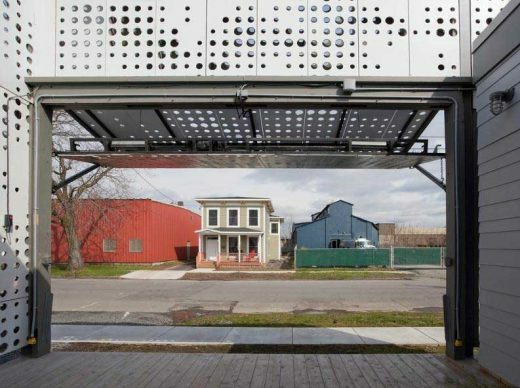 Local nonprofit Home HeadQuarters managed the construction process, which included training for a team of construction apprentices, cultivating a workforce for future sustainable building projects, and creating much-needed green-collar jobs. Homeowners John and Kathy Miranda moved into the home in November 2010 and use the home’s flexible layout to house an environmental consulting business, a small office space, and personal living space for the couple. 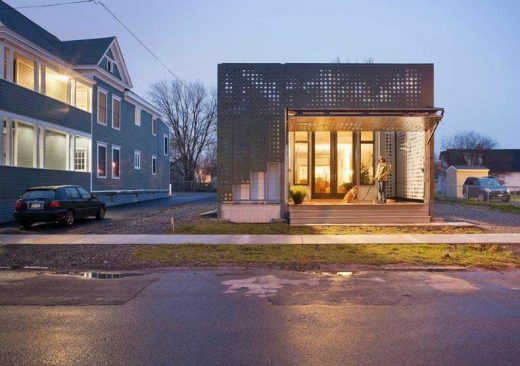 In practice, the home will function as a modern response to Syracuse’s 21st century concerns as a post-industrial American city.